Last week, Heather Rojo of Nutfield Genealogy wrote a blog post about clues from the plot card of a family cemetery plot. I thought I would share what I recently found from a plot card from Graceland Cemetery in Chicago, Illinois, about my second great-grandfather's family plot there. I had to mail a check for $5 to Graceland Cemetery, but in addition to receiving the plot cards, I had a helpful email conversation with their researcher to fill in a few blanks. It was well worth the $5. And many cemeteries don't charge you for the information, so it is always worth it to ask. Plot Card (page 1) for Lot 184, Section N, of Graceland Cemetery, Chicago, Illinois. 1. Elizabeth S. Greeley was the oldest daughter of Samuel Sewall Greeley and his second wife, Eliza May Wells. 3. Lucie Greeley, who died in 1861, was an infant daughter of Samuel and first wife, Annie, and with the sequential interment numbers, it looks like their remains were moved to Graceland together. 4. William Stokes was buried here in 1874 and his remains were moved to Mt. Hope Cemetery in 1911. More about him later. 5. Anna P. Greeley, who died at age 7, was the second daughter of Samuel and Eliza. 6. Henry S. Greeley was the third child and oldest son of Samuel and Eliza. It is noted that he died of Scarlet Fever in 1877 at the age of six. He was buried the same day he died. 7. Sarah F. Greeley and 8. Julia V. Greeley - I have not been able to figure out how these fit into the family. 9. 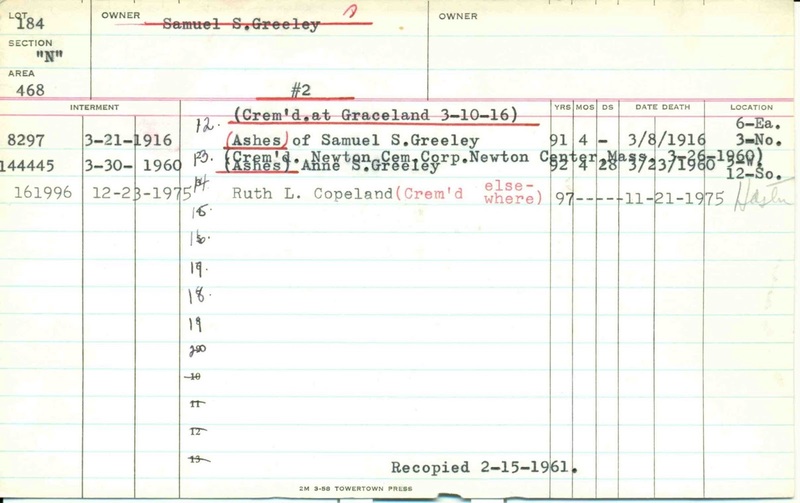 Annie L. Greeley is a granddaughter of Samuel and first wife, Annie. She was a daughter of their oldest son, Frederick and his wife Florence Arnold. Her remains were moved to Lot 187, Section N, which I found out is in the name of Isaac N. Arnold, Florence's father. (Click here to see his Find A Grave memorial.) Both Frederick and Florence are buried in that lot, as well. 10. Louisa M. Greeley was Samuel Sewall Greeley's sister and only sibling. From what I can tell, she moved from Boston to Chicago between 1860-1870 and appears in his household until her death. 11. Elizabeth M. Stokes died and was buried here in 1910, but, with William Stokes, was moved to Mt. Hope Cemetery in 1911. I was curious about William and Elizabeth Stokes so I searched for them in public family trees at Ancestry.com. I found a tree that had them as a married couple and I sent a message to the owner of the tree. Well, it turned out the owner of the tree, Teresa, was a great-great-niece of William and Elizabeth and had never known the exact date of William's death or where they were buried. She was able to tell me that they had come to Chicago from Ireland in 1872 and had a baby in 1873. Although the family in Ireland begged Elizabeth to return home with the baby, she stayed in Chicago. From our email conversation, I learned that William was a civil engineer, so that is the likely connection between him and my second great-grandfather, Samuel S. Greeley, whose obituary tells all about his career. 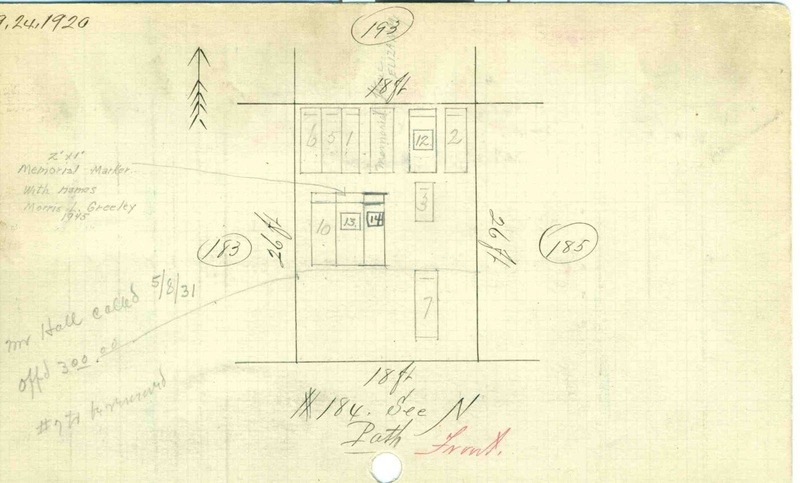 The back of the plot card shows the layout of the specific burial plots, and indicates that two are memorial markers (Morris L. Greeley and Eliza May (Wells) Greeley). It also shows that in 1931, a Mr. Hall offered to purchase part of this lot. It doesn't look like this purchase was ever completed. Plot Card (page 2) for Lot 184, Section N, of Graceland Cemetery, Chicago, Illinois. 12. 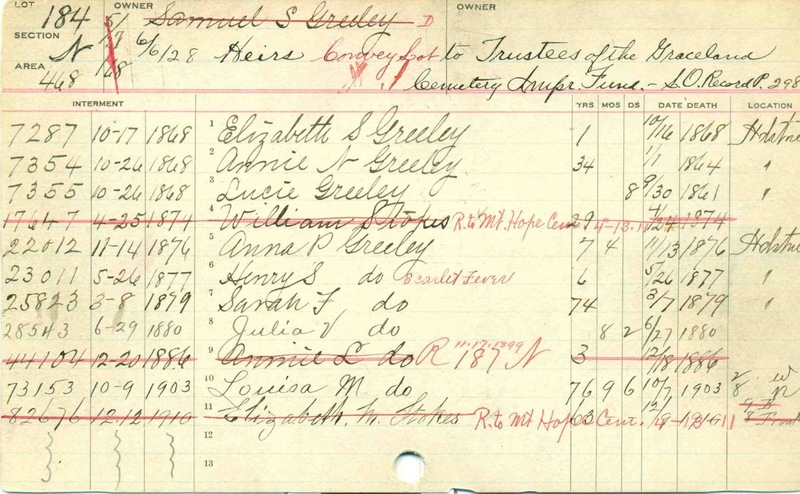 Samuel S. Greeley is my second great-grandfather and the original owner of this plot. 13. Anne S. Greeley is Anne Sophia Foote Greeley, wife of Morris Greeley. The researcher at Graceland was able to tell me that Morris L. Greeley (son of Samuel and first wife, Annie) was cremated at Graceland but his remains were delivered to an undertaker. So although he wasn't buried here, his wife was and together, they share a gravestone. 14. Ruth L. Copeland is my second great-aunt and step-great-grandmother (as second wife of Lowell Copeland, my great grandfather). She also has a memorial stone in Calais, Maine, where her husband is buried. That memorial doesn't include a death date. See the photo at Find A Grave. At FindAGrave.com, you can start at the memorial for Samuel S. Greeley, and see links to the memorials for other family members. I mostly have memorials for those who have gravestones. Note that Eliza May Wells Greeley, Samuel's second wife who died in 1880 in London, is buried in London, but has a memorial stone at Graceland. Website for Graceland Cemetery is http://www.gracelandcemetery.org/. I also have paternal ancestors, the Adsits, buried there. Wow! That was well worth a write up. You got your money's worth out of this information! Yes, Heather, the $5 was so worth all the information I got! And I still have more to share about the Stokes couple found in this plot. Which is why I always tell folks, "the dead can move" great post. Midge, I have found several cases of ancestors having been moved, as well as those who were buried in one place and have a memorial stone in another. I've got to start collecting more of these plot cards! I also got a plot card from Graceland. It was great, even though it brought mystery with it! Of course, Heather, as a genealogist, the mystery is more than half the fun! I hope you were able to solve the mystery. This is very interesting, and I am so glad you found my family tree on ancestry.com. William Stokes's great granddaughter, my cousin Barbara, is sure that the Greeley family helped William's widow, Elizabeth Stokes, when William tragically died in 1874 - just two years after coming to America. (We still have a mystery, how and why did he die?) Their son Harry went back to Ireland with his mother Elizabeth when Harry was in his teens and he completed his education to be a civil engineer like his father and grandfather before him. (William's father Henry Stokes was County Surveyor of Kerry). Harry went back to America in 1894 to find work as a civil engineer and resided with the Greeley family then. When Harry had got settled, his mother Elizabeth then returned from Ireland to join him. I am glad your family tree was on ancestry.com for me to find! And I thank you and your cousin for sharing additional information about my Greeley family. Before you contacted me I knew nothing of William Stokes burial but I had discovered that Elizabeth Stokes was buried at Graceland. Barbara was going to go to Graceland one day and look for her grave and see if William was in the same grave. It's lucky you got in touch because Barbara would have gone all that way to see it, not realising the remains had been moved!